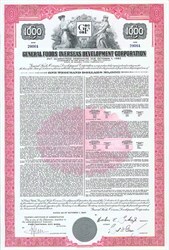 Pack of 100 Certificates - General Foods Overseas Development Corporation $1000 Bond- Price includes shipping costs to U.S.
Home > Certificate Quantities for Educators / Business Promotions > Pack of 100 Certificates - General Foods Overseas Development Corporation $1000 Bond- Price includes shipping costs to U.S. Pack of 100 Certificates - General Foods Overseas Development Corporation - Price includes shipping costs to U.S. Beautifully engraved certificate from the General Foods Overseas Development Corporation This historic document was printed by the American Banknote Company and has an ornate border around it with a vignette of two women flanking the company's logo. This item has the printed signatures of the Company’s President and Secretary.